Stocks are breaking sharply lower today on the next installment of Brexit panic with renewed depreciation in the British Pound to record lows. Major Bulge banks such as JPMorgan and Goldman Sachs have been expecting and hedging in anticipation of a 115 to 120 value for the British currency. There is now momentum that will be difficult to stop without significant calming words from UK’s PM Theresa May reversing expectations for stricter immigration policies and financial laws. This news will supersede US election news until support is encountered. Interestingly Goldman called for a 115 to 120 post Brexit value 5 months prior to the actual vote and they have stuck to their Bearish forecasts. Our technical extremes seem to correlate with this zone. The Exec Spec June Brexit forecast targeted the upper 120’s and now we can see potential for technical targets near 116. This 2nd wave lower in the British Pound Sterling is bad news for stocks short term. After the initial Brexit on June 24th the Dow sold off almost 6% or 1,000 points in just 2 days. A break under 120 this time has potential to snowball to similar if not even worse correction comparisons. Oil has broken above $50 and the Peso has continued its jump to 4 week highs as Russia and Saudi Arabia along with a faltering Trump election effort has generated new life for Oil Bulls – for now. Two weeks ago we posted the interesting correlation with markets and election polling data. We impart no bias here when we again state that the status quo stability of Hillary Clinton is more Bullish for various markets than the uncertainty factor of Donald Trump in the near term. The markets we highlighted as most affected by changing Presidential election prospects were Oil and the Mexican Peso, although the stock market also benefits short term as odds of Hillary electability improves. Two weeks ago with Oil prices testing $48/barrel we gave a time and price window for prices to reach $50 correlating with the resurgence of Hillary in the polls. Clearly the OPEC rhetoric of potential supply restrictions in 2017 has also propelled prices and OPEC news remains a key factor. However, Trump injects fear of trade wars and economic uncertainty which tends to deflate prices. With Hillary’s pre-election poll numbers surging since late September after each of the last 2 debates, the political tailwind may now be tiring. Should Trump surge back under a 4 point deficit in the national surveys then downward pressure on Oil is likely. OPEC of course placed a solid floor under prices at the September 28th meeting in Algiers by agreeing to a reduction of Oil production levels with Russia from peak levels near year end. From this meeting Oil rallied a whopping $7 in 7 days while piercing the psychological barrier of $50. A test of contract highs in the $52 – 54 range is the next target while we await the climactic OPEC meeting on November 30th to reveal the details. We almost always expect OPEC production cuts to fail and in the long run this agreement is fatally flawed. However, it’s crystal clear that Russia and Saudi Arabia are engineering a modest energy rally into the $50’s. 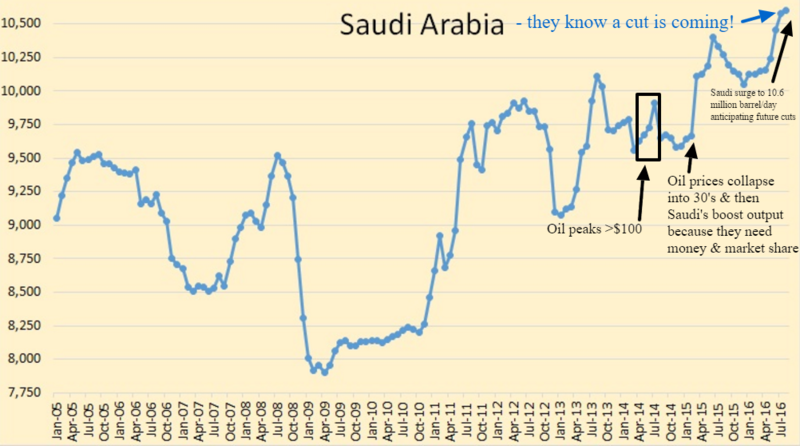 In the months preceding the rumored OPEC plan to freeze and then reduce Oil production, Russia and Saudi Arabia pushed output levels to unsustainable peaks. Now they can pretend to be OPEC leaders in cutting their massive 22 Million barrels a day output throughout the 1st half of 2017. (1) They have to cut production due to technical difficulties maintaining such lofty levels and (2) typically their production experiences seasonal declines in the 1st half of the year due to demand. Thus while they await world demand to catch up to supply and start reducing extreme inventories, they can buoy prices psychologically under the guise of “cutting” production. In reality this is the equivalent of a store claiming everything is half off after they raise price 100%. What OPEC and Russia can’t control is the demand component of a sluggish global economy, inventory growth and increased production from high tech drillers in the US and Canada as prices sustain above $50/barrel. Eventually Russia and OPEC will lose market share and suffer a more dire outcome during the next serious global slowdown. Assuming there is no recession in 2017 we feel Oil can maintain a $45 to $60 zone going forward. The real test near term is the current Brexit induced rout of the British Pound and corresponding Dollar appreciation. Should the US Dollar keep rising while the Pound depreciates, then Oil will eventually fall sharply. Peso valuations are well correlated with Mexico’s Oil economy and Oil price, but it’s more than a coincidence that the Hillary vs Trump election polls have been even more influential in recent months. Trump’s harsh rhetoric toward trade deals and Mexico in particular sends the Peso plunging when Trumpian popularity soar. Looking at the first debate win by Hillary and the 11 year old vulgar tape released recently correlates precisely with the very sharp price surges in the Mexican Peso September 27th and October 10th. Should this election race tighten sharply to within a few percentage points in the national polls we may again see Oil and the Peso plunge. A Brexit rout of the Pound toward 116 however should cause also cause weakness in the Peso. Looks like the election news has finally been overtaken by Brexit news – and that is quite an accomplishment these days!